We're in this middle of this amazing trip. I feel so fortunate to have these opportunities. People keep asking me how I started working for myself and how I got to this point in my life. I thought it might be helpful to answer it. In 1999 I got my first job in the temporary staffing industry. I worked as a recruiter for a franchise of a national chain in Michigan. I made $12 an hour. That was the most I made an hour ever, so I was excited. I quickly realized there was a problem, but I didn't trust my instincts. It turns out the company hires "recruiters" in bulk. They hire college graduates who don't have a lot of experience, give them training, and then throw them from the frying pan into the fire. My training class had about a dozen people. After six months of working for the company, there were only two of us left. A Facebook update from February 2012. I quit that April. This was a red flag, but I am a resourceful person so I made it work. It was more money and experience than the retail jobs I had before. My college degree in Anthropology wasn't landing me anything else so I stuck with it. And you know what? I was pretty good at it. So, after a year I started looking for another job in temporary staffing. I found a job with a small, local staffing firm and quit. But I hated that job too. I quickly realized that my training from the first company was sadly lacking. I was still good at it, so I stuck with it. Eventually, I got recruited away by a company who wanted to start internal recruiting. I took the job because I was unhappy. That third job wasn't any better. I was making a little more money but they didn't have enough business to really justify a full time recruiter. I volunteered to work the front desk after their previous receptionist went out on maternity leave. 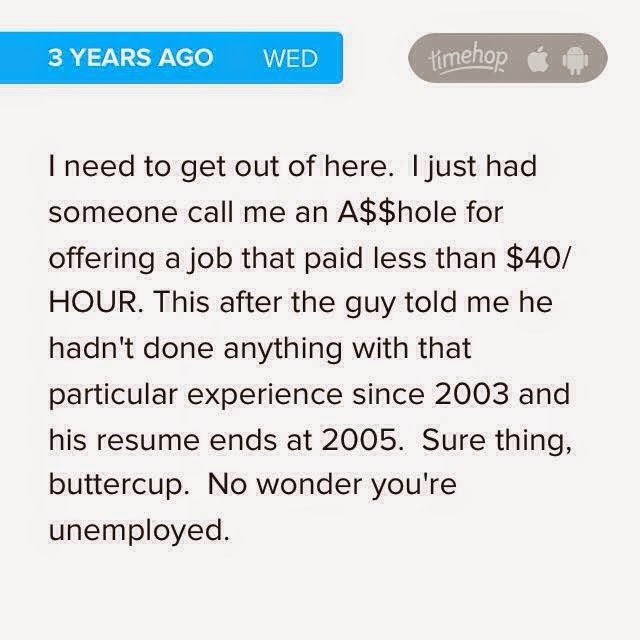 I was making a recruiter's salary for answering phones and playing around on the internet. It wasn't so bad. Then we moved to Georgia. My first job in Georgia was actually the first I really loved. But the company was a start up and 8 months later I was unemployed. So I went back to agency recruiting. I was good at it. It was easy for me. I just didn't like it all the time. I justified things a lot. My co-workers were pretty cool and it was a small office. My boss rocked. Those things were quite true. But the job itself? It just wasn't what I expected I would be when I grew up. I didn't always like who I was while I worked there. I was at that job for 8 years. Somewhere in the middle Matt and I came up with this harebrained idea to build a tiny house on a mountain in the middle of nowhere. It would be off the grid and if we lived there we would have no expenses. Suddenly, I recognized the possibilities. If I worked really hard at this thing, I could completely change my life. I realized one thing that I hadn't before. I was the one who had to change, not my job. Every time I left a job due to dissatisfaction I thought a new place would be the answer. I thought things would be different. They never were. I finally recognized the truth that there is one common denominator in all of my unsatisfying relationships...and that was me. I needed to make a big change in my life. I needed to change the way I thought about things. I needed to give myself permission to explore possibilities and even fail. I needed to stop following the path of least resistance because it was the responsible thing to do. I took a leap...without a net...and I didn't fall. In fact, I'm still soaring. That's what deliberate living can do for you, regardless of the path that takes you there. I can relate to your work experience as I surf the net at the high paid job. Thank you for the reminder that its me. Greatly appreciated and of course the the learning experience from your journey of a tiny home dweller/builder. I too had a hard time getting out of school and finding work. I had a strong idea of what I wanted to do, even as early as my preteens, but getting established was hard. I worked for several companies were it seemed like management believed personal abuse was how money was made. It took me about 5 years until I found a place were I feel like i was appreciated, and another 5 until I found a place where I felt the work I was doing was really important. Point is, know yourself, but sometimes it really is a toxic environment, and you need to get out. You've hit home. I don't always like myself at my job either. And they're beating us up for more and more work now. It's time to leap. But it's so scary. Dig it! I can definitely say that I need a bit more deliberate living in my life, attitude adjustment with it! An anthropology and unemployable? Sounds familiar. Because that's me too. ;) Love the site!